My old fixture's wiring went haywire. It was cheaper to replace it with one in a silvery finish from the Habitat Homestore. I love that brushed silver look. The hair scrunchi you put on the chain is funny. Looks better than an ugly chain, though! I never thought about it, but it does look like a hair scrunchi. Sarah, I made my chain cover the very same way--with a small remnant of silk glued into a tube and pulled inside out. 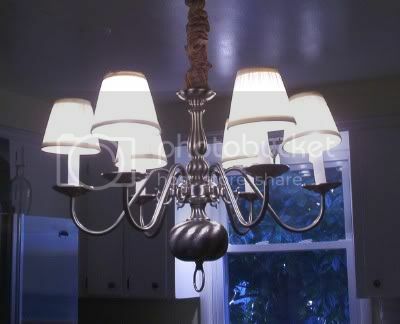 It looks better than the chain, anyway, and that's what most expensive homes use with their chandeliers.